We are delighted to announce that Kitty Wheeldon Gardens in Sale has been successful in receiving grant funding. The Salvation Army were initially approached by a charitable trust to offer a potential final gift as the trust is winding down. The Housing team were asked to look at funding options. Kitty Wheeldon Gardens has 23 one bedroom two person flats for the age group 55 plus. The scheme was opened on 21st July 1993, by Dame Vera Lynn. The scheme was dedicated in the memory of Kitty Wheeldon, who was the wife of Leslie Wheeldon, who donated to The Salvation Army for the scheme to be built. The team consulted with residents on what they would like to see investment in with the residents choosing the conservatory and the brick work in the courtyard. The conservatory was built over 20 years ago. 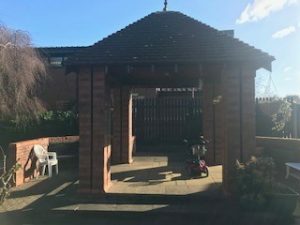 The residents use this as a place to meet, however there are some foundation problems and they wanted to extend the current conservatory to the gable end and have a proper extension roof on the existing one. The brick work in the communal garden is completely perished and needs replacing. The residents on the scheme play an active part in the up keep of the gardens and have won awards over the years. They feel this would be a great benefit to the community and will ensure residents are involved in making the scheme a beautiful place to visit. The proposal was put forward to the Charitable Trust through the Salvation Army who have very kindly offered £45,000 to get these works done which will hugely benefit the residents on Kitty Wheeldon Gardens.